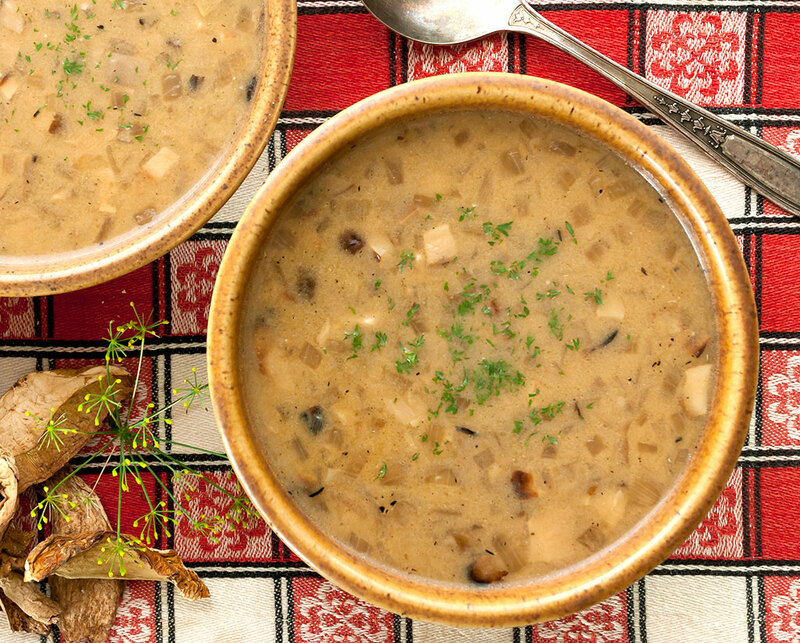 This simple, much-beloved soup, made with the large, meaty mushrooms called “borowik” in Polish, is traditionally served on Christmas Eve. Of course, there are as many different versions of this soup as there are Polish cooks (and their numerous descendants). Here is our recipe, which we think is a very nice version indeed. Here in the U.S., the borowik is most commonly known as the boletus edulis, king bolete or porcini mushroom. Mushroom lovers at home and around the world prize it for its superb, rich flavor and substantial, meaty texture. Our recipe uses both fresh and dried mushroom for maximum mushroom flavor. Using fresh & dried in the same recipe is an old trick that combines the rich flavor of dried mushrooms with the pleasing texture of the fresh. 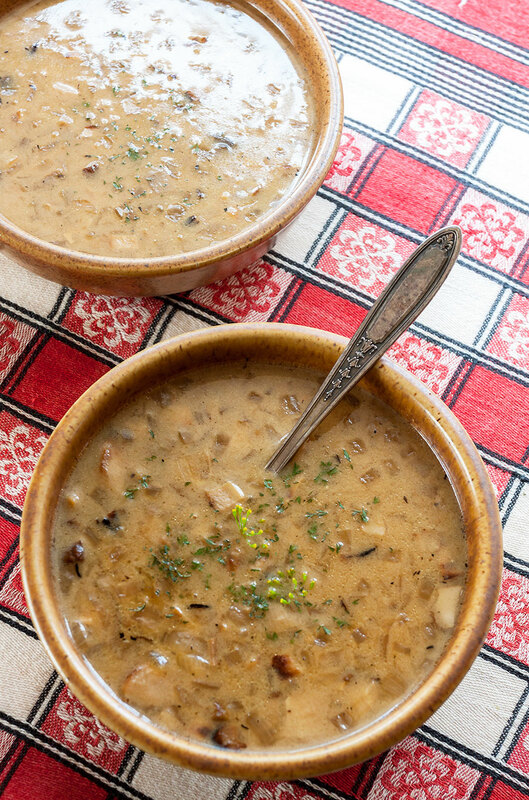 You’ll also notice that we have added the dried mushroom soaking liquid to the soup, a method that captures every last drop of the mushroom’s essence. Drying mushrooms is not only an age-old method for preserving this precious foodstuff, it also transforms the flavor, intensifying and concentrating it into something deep, complex and satisfying. And while the fresh mushrooms are only available at certain limited times of the year, dried porcini are readily available at any time. Those old timers knew a thing or two about how to wring every drop of flavor out of simple, inexpensive foods. That’s why traditional recipes like this one are still with us today. This recipe makes a generously large pot of soup, suitable for feeding a crowd, with plenty remaining for leftovers. Of course, as good as this soup is, everyone knows that any soup is even better when reheated the next day. Place the dried mushrooms in a bowl and cover with the 6 cups of hot water. Soak for 30 minutes or up to 4 hours, or until the mushrooms are softened and pliable. Coarsely chop the fresh mushrooms. Heat the butter in a large pot over medium heat. Add the onions and sauté for 5-7 minutes until softened and translucent. Add the chopped fresh mushrooms and sauté for another 15 minutes. Add the stock and bring to a low boil. Strain the reconstituted dried mushrooms, reserving the soaking liquid. Rinse the strained mushrooms briefly under cold running water to remove any traces of grit. Carefully decant the strained soaking liquid into the soup, making sure to exclude any remaining grit or debris. Chop the reconstituted mushrooms coarsely and add to the soup. Cover the pot and reduce the heat to a low simmer and continue to cook for 30 – 45 minutes. Whisk the flour into sour cream until smooth and lump free. Temper the sour cream/flour mixture by gradually adding about 1 cup of the hot soup to the sour cream, mixing constantly until smooth. Now pour the sour cream mixture slowly into the pot, stirring constantly. Reduce the heat to low and simmer for five minutes, stirring occasionally. Add salt & pepper to taste and stir in 3 tablespoons of the dill. Serve garnished with the remainder of the chopped dill.